The single eye, the waning Heliosphere of our Sun, and the cosmic second coming. This article should make more sense when reading if it follows a previous blog post called ‘Ophichus and the galactic alignment’. Another of my blogs ‘2012 and the end of the mayan long count’ follows on from this. Dionysus, the greek god and son of Zeus and Persephone. He was the god of wine, and the god of epiphany and mysticism. He had a cult which followed him that sought to reach altered states of perception through intoxicants. The romans named him Bacchus. Dionysus always carried a staff or rod with a spiral vine coiled around it, which was capped with a pine cone. 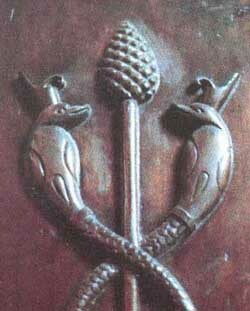 The pine cone is a standard reference to the pineal gland which is shaped as a pine cone. Many cultures have used a pine cone as a representation of a spiritual link to God. 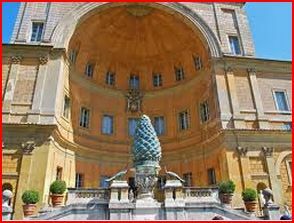 The Freemasons also use the pine cone in a lot of their symbolic references. Freemasonry can also explain the meaning of the rod to represent the spinal column which has 33 vertebrae. The masons have 33 steps leading to enlightenment. In this case enlightenment is represented by a pine cone which in turn represents the pineal gland situated at the head of the spinal column. 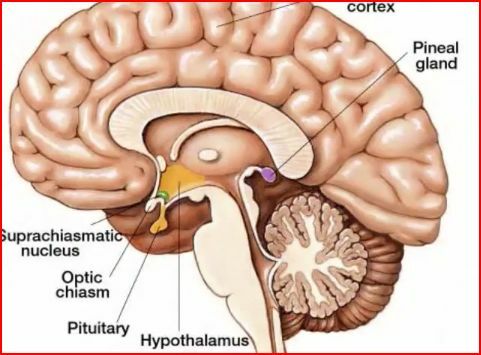 The pineal gland as I have explained in previous posts is a small gland near the centre of the brain which produces melatonin, a hormone which controls our waking and sleeping. It is shaped like a pine cone and known to contain a liquid sac which is full of micro crystals. This little gland has much notoriety in mystical tradition. The ancient Egyptians seemed to be aware of its existence and also its functions. It is often attributed as the third eye which when awakened allows us to see through a different perception. 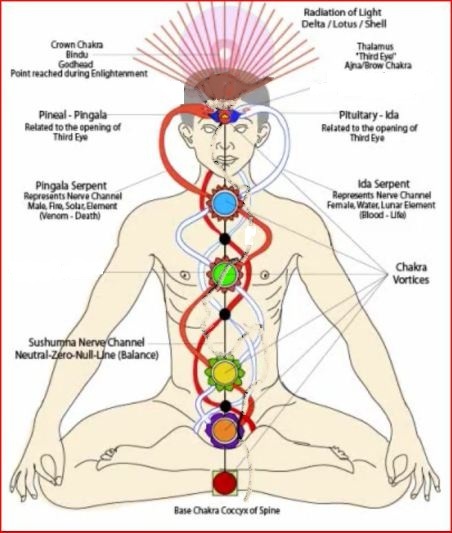 Hindu and esoteric medicine has always known of seven Chakras [or energy vortex] which run in a line through the body that follows adjacent the spinal column to the brain. Through them flows the energy or lifeforce of the body. The chinese call this energy Qi. The Hindus beleived the energy to be divided into two seperate streams of male and female based energy called Ida and Pingala. These two streams of energy coiled in alternative spirals through the chain of chakras. The international recognised symbol for medicine shows these two spiral enegies represented as two snakes coiled around a staff. There is known to be a reserve well of primal energy that sits coiled at the base of the spine. It is called Kundalini and remains a dormant potential force in most people throughout their life. Many people claim to have awakened their kundalini energy through the practice of yoga. In others it is claimed to have spontaneously awakened unleashing a very potent force. When Kundalini awakens, it starts its ascent to the head centre, after responding to the vibrations from the ‘light in the head’. When it awakens the process is known to be an uncomfortable and almost traumatic experience for some. The energy release along the spinal column has sometimes been compared to a water hose twisting in the air under the pressure of the water trying to escape. Many people have also laid claim to having opened their third eye through the rising of the awakened kundalini. Of this I have some doubts. The third eye is made of three components. The pineal gland, the pituitary gland , and the optic- thalamus gland which is in the centre of the brain. The all seeing eye of Horus is thought to be a pictorial representation of all three glands making up the third eye in the centre of the brain. .
Until now, the cosmic photon rays that are required as the catalyst of this change have remained unobtainable. The sun’s magnetic field is the first line of defence against these highly-charged, energetic particles. The entire solar system from Mercury to Pluto and beyond is surrounded by a bubble of solar magnetism called “the heliosphere.” It springs from the sun’s inner magnetic dynamo and is inflated to gargantuan proportions by the solar wind. When a cosmic ray tries to enter the solar system, it must fight through the heliosphere’s outer layers; and if it makes it inside, there is a thicket of magnetic fields waiting to scatter and deflect the intruder. At times of low solar activity, this natural shielding is weakened, and more cosmic rays are able to reach the inner solar system. That is the “heliospheric current sheet,” a vast transition zone where the polarity of the sun’s magnetic field changes from plus (north) to minus (south). The current sheet is important because cosmic rays tend to be guided by its folds. Lately, the current sheet has been flattening itself out, allowing cosmic rays more direct access to the inner solar system. When you also factor in the knowledge that earths own magnetosphere is worryingly shrinking since the 1990s, you realise that we may no longer be able to shield those cosmic rays that we see as harmful. Our solar system is moving through interstellar space. As it moves forward it is tightly gripped by compressing lines of the interstellar magnetic field. This field exerts force against our suns own magnetised heliosphere. Apparently this process has been described as similar to a snake swallowing a small mammal. 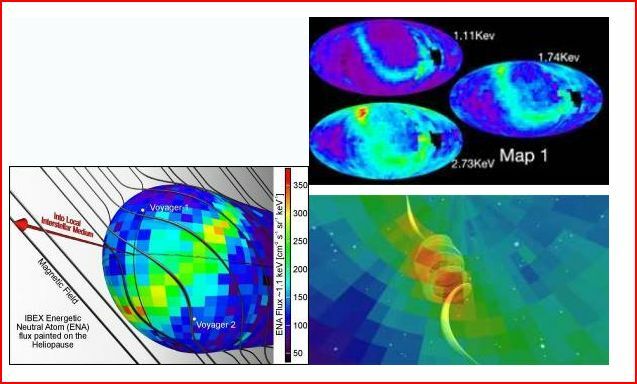 The interaction of the two magnetic fields create a band of energetic neutral atoms [ENAs] which used to form a continuous circle of coiled energy at the perimeter of the heliosphere. This was believed to act as a magnetic shield around us which neutralized any incoming cosmic rays. Thanks to the vision of Voyager 2 which left the solar ecliptic in order to bypass Uranus and Pluto, we have been able to observe the coiled ENU flux energy. Astrophysicists have been perturbed by recent changes [see map1 ] which show that a ‘knot’ tying the coiled energy into a continuous circle seems to have unravelled and the ring is now seeming to dissipate. Similar to the hole in our ozone layer, this may represent the kink in our armour that allows cosmic rays to penetrate deep into our heliosphere. Astrophysicists have also found another recent anomaly. This is a change in the density of our solar wind. In 2008, Nasa’s craft Ulysses 2 which measured solar wind has noted a 20% decrease in the density of solar wind since the first measurement taken in 1994. The density has probably decreased further since then. It is this reduction in the density of the solar wind which is believed to account for the shrinking of the heliosphere. All of these recent discoveries seem to point to an inevitable increase in the ability and amount of cosmic rays of charged particles to actually reach us on earth for the first time in a very long time. I suggest that perhaps this weakening in our heliosphere coinciding with our ecliptic aligning with the dark rift or centre of our own galaxy is no coincidence. Astrophysicists have noted that interstellar magnetic fields are increasing substantially in strength as we cross the milky way’s ecliptic. Perhaps this is a cyclical time in which certain cosmic rays are enabled to penetrate the defences of our sun and reach Earth. Perhaps some of these rays will be able to penetrate our crown chakra of the head and act as a catalyst to awaken the Kundalini energy coiled tightly at our base chakras. 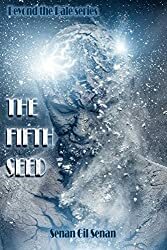 This awakened Kundalini might in conjunction with the initiating cosmic energy fuse the three components glands of our potential third eye into a cooperative working state. I personally believe that the change effecting us will be dramatic. This is because of a verse in 1st Corinthians in which Paul talks about the final days. He says that prior to the ‘rapture’ , that ‘All shall be changed in the twinkling of an eye’ .The rapture refers to a biblical prophesized event whereby the faithful believers in Jesus are seen to disappear as they are taken by the returning ‘spirit of Christ that resides in the clouds’. 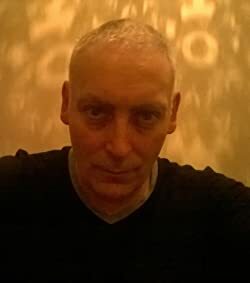 Although not all other religions & cultures recognise or believe in a ‘rapture’, many other cultures refer to a ‘quickening’ or a dramatic change in the perception of each person. However if I didn’t believe in this dramatic change, my logic would tell me that the change would be to our DNA and would start with our next born. [Matt 6:22] The light of the body is the eye: if therefore thine eye be single, thy whole body shall be full of light. But if thine eye be evil, thy whole body shall be full of darkness. If therefore the light that is in thee be darkness, how great is that darkness! This verse is from Matthew 6 and from the sermon on the mount by Yeshuyah or as we know him Jesus. I feel that he is definitely referring to the single eye vision of the third eye. Again he refers to a situation in which our only vision is through this third eye. In this circumstance , he implies a change effecting all. However the nature of that change seems to depend up on what spirit or light inhabits us at the time of this dramatic event. We already know from modern science that our cells emit photons or light at differing wavelengths. The Egyptians spoke of the great light that would shine from the opened third eye. We refer to people having negative or bad energy. Perhaps this is the light of darkness within ourselves that Jesus refers to in this verse. Taking this in context, he seems to imply that the opening of the [third] single eye will magnify the energy/light that resides in our bodies. That is those that have good intent in their hearts/souls will see this good energy magnified many fold. So it also implies that those with negative energy residing in their heart/souls will also see this energy magnified many fold. To me this is crucially important and I will come back to this. First I have to answer the question of what exactly Yeshua Yahweh or Jesus has to do with the opening of the single or third eye. Well after Jesus died, he resurrected as the Christ, or the ‘anointed one’. When he spoke to his apostles on the mount of olives Matt 24:30, he told them that he would return to earth as a saviour and judge again but this time as a powerful spirit force. I feel that this spirit of Christ may well be forging its path towards us in the form of a cosmic energised ray of immense strength which is breaking through the barriers of the ENA flux barrier and the shield of our Sun’s Heliosphere. Jesus states many times that the world does not belong to him or to his father but instead is ruled over by Satan. This is why I believe that the early Christian church was perverted into yet another Sun worshipping religion. Elements of both Egyptian and Persian Sun worship were indoctrinated into the new Judo-Christian faith. Solar worship Feast days and myths were ‘Christianized’ and taken over. We are in this world controlled and ruled by the energy of the Sun. Many people believe that each planet including our own is sentient. What if the Sun too is sentient, what a powerful consciousness that would be. Now imagine that we humans were invested with a spirit that was immortal and not of this solar ruled world. Assume that that spirit was infused into earthen clay or infused into a created mortal based life form. All living cells emit photons of light, they grow out of a DNA blueprint, and all living things probably have a degree of sentience in their differing degree of development of their own souls. That is all except Humans , whom also have an eternal spirit bound together with our earthly mortal soul. Humans have sought atonement since the beginning of our days on earth. That is the reunion with God or ‘At One’ [with god] ment. Our Spirits were not ‘divided selves’ when they were once part and belonging to Gods Spirit. For a reason that I don’t fully understand, our Spirits have ‘fallen’ to the lower dimension of earth where they remain bound by a chain of earthly souls to this earth and this dimension. I’m not sure about you hanging the body of your blog onto quotes from the bible. In the 1500’s when we were trying to get away from the ecleasiastical power of the Roman Church, with it’s heirarchical chain of command of priests, bishops, cardinals and pope, it was OK to put about the Protestant myth that the bible contained the preserved truth of God, because then we could say the bible was the sourse of our authority and not the Pope. Now, as we know from the Nag Hamedi scrolls and the Dead Sea scrolls, the New Testament that came down to us in the form of Mathew Mark, Luke, John, Acts of the Apostles etc, were only a small selection of gospels that fitted in with Roman Emporer Constantines Sol Invicta cosmology, as decided by the Council of Nicea in 325AD. Even with what we did receive officially through the Christian sects why would we trust that the wording has remained the same over 2000 years. Also, as we are treading into areas that are inneffable, why would we think setences from the past could encapsulate great spiritual truths? Regarding the ultimate truths of Christianity and the sourse of its Authority I would like to reference a little known, but in my mind a highly important movement within Protestantism that had it’s origin with people who were called the Zwickau prophets. Luther challenged the power of the eccleasiastical church by saying true authority came from the scriptures, and would quote sections of it (like you do above) to prove a point. The Zwickau prophets challenged both the Church and scriptures and said the ultimate authority and truth came from direct revelation from the Holy Spirit. matt6:22 & matt24:30 are direct quotes from Yeshua aka Jesus. The first one referring to the single eye was from his sermon on the mount and in which he seems to be telling us something that is of crucial importance. In the second quote, he answers definively on in which manner he intends to return and when. The last bible quote from the revelations is important because it is always ignored by those who always attribute the phrase ‘the bringer of light’ [or ‘lucifer’ in latin] to have some satanic connection. Lucifer is not a person, it is a latin phrase that has no correlation or relevance to Satan or the Devil. I accept what you say about direct revelations from the Holy Spirit. However, every prophet throughout Judaic-christian-islam times has claimed this. So therefore whom do we beleive. Is everything that Mohammed or Mani said also true. When it comes to teachers, you have to either buy in or opt out. If you also wait for personal enlightenment, it may never come. However whenever one makes an initial step along a path or leap of faith, inevitably a teacher always comes along to help you on your path. Thanks, good article. I had not thought of the eye of Ra as being a depiction of brain action but now I wonder. I had known about the ram headed staff being a resemblance to the spinal cord and the thalamus. I had also thought that the Iranian Zorosterism was an effort to take the by-then multiplicitous gods of India and narrow it down to one again; they started with The Lady and rapidly replaced her with one supreme god. This was right at the time Egypt was trying also to pry power from the hands of the priests and make one god, Atun. All the histories are the same. 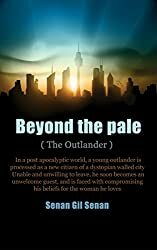 The civilization rises on rationality and common sense and power corrupts and results in religion/priests controlling power which eventually deteriorates into a power struggle of kings against priests which then rives off into an effort to create a single God controlled by a section of the power people. i had not known about the Eye of Ra being related to brain structure; I had known about the ram-headed staff being the spinal column and the hypothalamus. How else can all this history be explained except by a society more in tune with nature and advanced enough to apply it? 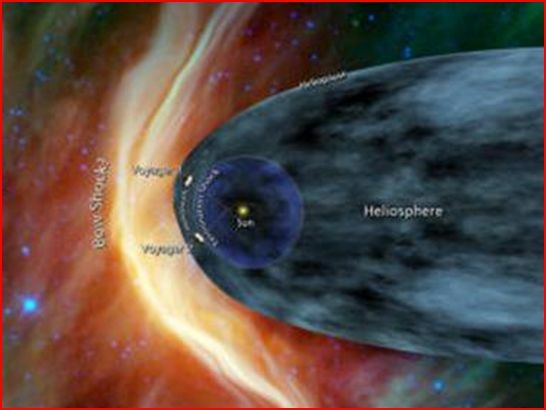 As for the energy, I have a theory that our heliosphere was more compressed then, and has been periodically since, and that makes the difference.